Wash hands. Preheat the oven to 375˚F. Cook the chorizo in a medium sauté pan until browned. Add the onion, garlic, and red pepper to the pan, and sauté until cooked. Remove from pan. Add the hash browns and 1 ½ cups cheese to the mixing bowl. Stir to combine. Next, add the chorizo mixture. In a separate bowl, whisk together the eggs, milk and black pepper. Then add to the hash brown mixture. Stir to combine. 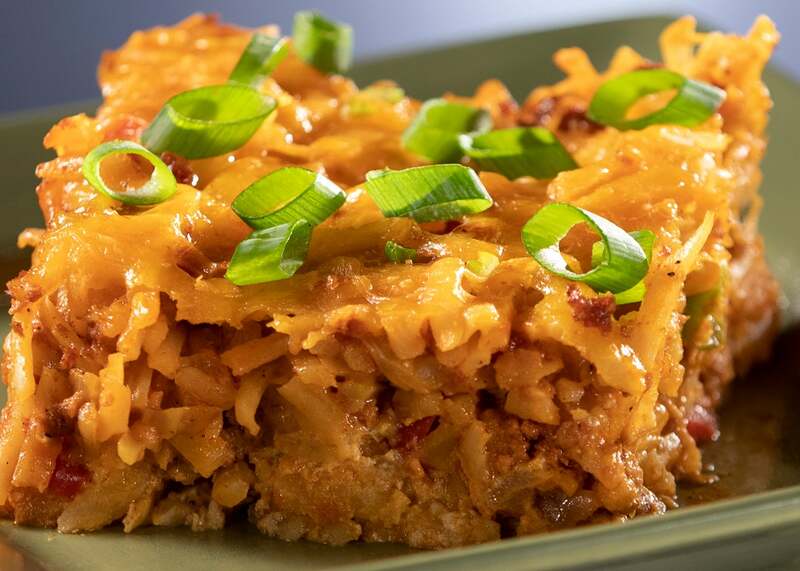 Pour the mixture into a baking dish and top with the remaining ½ cup of shredded cheese. Cover with aluminum foil and bake for 30 minutes. Then remove the aluminum foil and bake for an additional 10-15 minutes until the potatoes in the center are cooked through. Remove and let cool for about 5 minutes. Sprinkle with green onions and serve.